It’s amazing sometimes how kids “get it” more than most adults do. This weekend I spent time with my favorite Lifestylist® - Jenna. She understands how rooms should be designed around the interests and Lifestyle of the client and her room is the perfect example. With Jenna, it’s all about pink and ponies. If it’s a pink pony, even better. 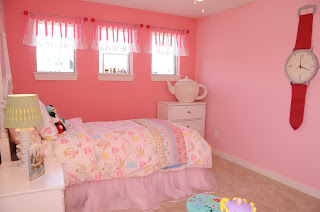 She has taken a personal interest in designing her room and has done a remarkable job. Her Mom let her choose her own furniture, bedding and lighting and it’s ideal for what she needed. A bunkbed with bookcases houses her growing book collection and the top bunk has become the “stable” for her ponies. Wall shelves allow her to organize her other collections in a neat manner. Kids rooms should be about kids. A place where they can dream, learn, grow, and above all, a room that’s all about them. The Really Fab Lifestylist speaks about Cooking, Culture, and creating a home that is as unique as you are.